.csv is the abbreviation for Comma Separated Values. It is an open, plain text spreadsheet format. Since the .csv format is a plain text itself, it is possible to use a spreadsheet program or even a text editor to edit the .csv file. Krita supports the .csv version used by TVPaint, to transfer layered animation between these two softwares and probably with others, like Blender. This is not an image sequence format, so use the document loading and saving functions in Krita instead of the Import animation frames and Render Animation menu items. The format consists of a text file with .csv extension, together with a folder under the same name and a .frames extension. The .csv file and the folder must be on the same path location. The text file contains the parameters for the scene, like the field resolution and frame rate, and also contains the exposure sheet for the layers. The folder contains *.png picture files. Unlike image sequences, a key frame instance is only a single file and the exposure sheet links it to one or more frames on the timeline. Krita can both export and import this format. It is recommended to use 8bit sRGB color space because that’s the only color space for TVPaint. Layer groups and layer masks are also not supported. TVPaint can only export this format by itself. 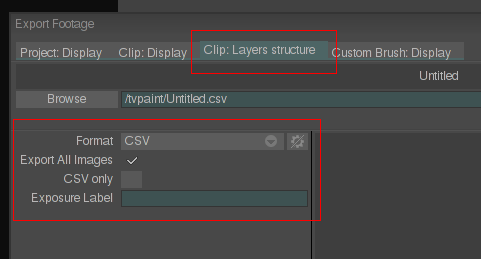 In TVPaint 11, use the Export to… option of the File menu, and on the upcoming Export footage window, use the Clip: Layers structure tab. To import this format back into TVPaint there is a George language script extension. See the “Packs, Plugins, Third party” section on the TVPaint community forum for more details and also if you need support for other softwares. Moho/Anime Studio and Blender also have plugins to import this format.